Renault and Nissan have pledged to continue their alliance as its architect, Carlos Ghosn, resigned from the French carmaker. Mr Ghosn’s resignation came as he remained incarcerated in Japan where he is accused of financial misconduct at Nissan. Renault said Michelin’s Jean-Dominique Senard had been appointed chairman, and Thierry Bolloré chief executive. Mr Ghosn was sacked by Nissan shortly after his arrest on 19 November. Renault’s management shake-up was welcomed by Nissan’s chief executive Hiroto Saikawa. “In the big picture, this is a big milestone that we are reaching. We are starting a new chapter. So I welcome this new leadership of Renault,” Mr Saikawa said. The architect of the Renault-Nissan alliance, Mr Ghosn had not been sacked by Renault. Instead, the French car giant had handed day-to-day operations to Mr Bolloré, who now takes the role permanently. Mr Ghosn faces three charges in Japan of financial misconduct, including understating his income and aggravated breach of trust. He denies any wrongdoing and could remain in custody for months after his application for bail earlier this week was denied. 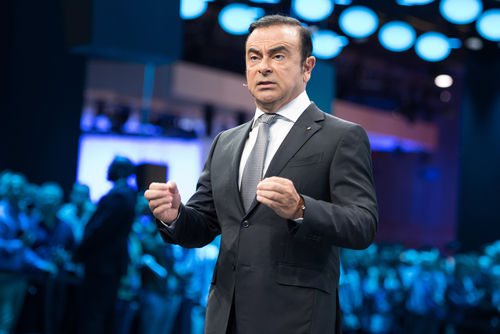 Questions had been asked about future of the alliance – which Mitsubishi joined three years ago – which Mr Ghosn oversaw. It sold 10.6 million vehicles in 2017 and together employs 470,000 around the globe. On Thursday, as Renault announced its boardroom change it did not use Mr Ghosn’s name but said: “The board praised the alliance’s track record, which has enabled it to become the world’s leading automobile manufacturer”. Until his arrest, Mr Ghosn had achieved star status in Japan. Born in Porto Velho, Brazil, to Lebanese parents, according to one poll he was the man most Japanese women wanted to marry and in another he came seventh in a poll of who should run the country. He oversaw Nissan’s recovery after Renault took a stake in the then-troubled car maker in 1999, the start of the alliance. Renault’s new chairman, Mr Senard, will be responsible for managing Renault’s alliance with Japanese carmaker Nissan, while Mr Bolloré will co-ordinate the carmaker’s activities. French Finance Minister Bruno Le Maire told AFP the government, which owns a 15% stake in Renault, would be “extremely vigilant as key shareholders on the exit conditions that will be set by the (Renault) board of directors”. He said Mr Senard’s main responsibility “will be to ensure the future of the alliance between Renault and Nissan and to strengthen it”. “They are going to have to come up with new ways to glue it together,” Prof Bailey said. Renault has said previously that it has not found any evidence of wrongdoing yet, and an investigation into executive pay has shown no signs of fraud so far. Mr Saikawa said “communication between the boards of the two companies has been a bit difficult” since Mr Ghosn’s arrest, and that he was looking forward to “better communication”. Nissan said it had now begun preparations to hold an extraordinary general meeting in April to discuss new board members. The agenda will be to cover the departure of Carlos Ghosn and Greg Kelly, an aide to Mr Ghosn who was arrested in November and bailed on Christmas Day. The shareholder meeting will also cover the appointment of a new director to be nominated by Renault.